Odile Annesley has been living in self-imposed exile in France for forty years following a family tragedy. With her eightieth birthday approaching, she contacts her scattered grandchildren to give them details of her will. The five very different granddaughters see it as the perfect opportunity for a get-together. There’s solidly married Clemency, the perfect wife and mother; ambitious London property dealer, Madeleine; chic Parisian dress designer, Elodie; cautious, academic Isabelle, straight from Quebec; and poor, deprived Cherie, the misfit. Each has grown up in a different world, but, like all families, some of the shared characteristics are there: the nose, the determination, the loyalty, the wit. There are boys too and none is more prominent than Cousin Harry, the golden architect with hidden problems and a make-believe marriage. Harry needs money, fast – and that is where the trouble begins. For as his world shifts, out come the secrets, long buried in the cracks and crevices and – for everyone’s safety – far better forgotten. 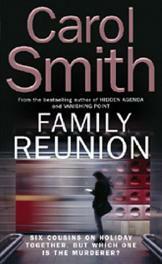 Family Reunion is a superbly enjoyable compelling novel from the bestselling author of Darkening Echoes.